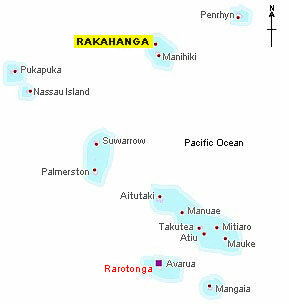 There are two main islands and seven motus or islets in the Rakahanga lagoon. On the east these are: Akaro, Motu Ngangle, Huananul, Motu Mahuta and Motu Okakara. On the southwest side the islet of Te Kainga ("the home") guards the widest passage in to the lagoon. It's also the original dwelling place of the first residents. Unlike other islands, the Rakahanga lagoon isn't suitable for pearls. Huge coconut crabs (left) are its gems, and fishing is good on the outer reef. Large sea turtles abound there too. Each January, a tuna fishing contest takes place and boats return with 200 or more fish a day. Vegetation is abundant, large breadfruit trees line village paths and coconut palms and pandanus trees thrive. Women weave fine rito hats, mats and baskets from the pandanus leaf fibres. "Cut up the puraka into small chunks about the size of a thumb. Put them in a pot of boiling water, along with a coral rock about as big as your hand, and cover the pot. Cook it all for three hours, adding some salt and pepper every hour or so. When the three hours are done, drain away the water, throw away the puraka and eat the rock. It will still have more flavour than the puraka!" Up to date information about Rakahanga is almost non-existent, because it's very rarely visited by outsiders. There's even doubt about who discovered it in the first place. Some say it was the Portuguese navigator, Ferdinand Magellan in 1521, but academic research hasn't been able to confirm this. "If there are places left where a man can grow old contentedly, it is on some such quiet, drowsy atoll, where today is forever and tomorrow never comes; where men live and die, feast and sorrow, while the wind and the waves play over the wet sands and gleaming reefs"
Rakahanga was given a bright new look at the beginning of 2012. Dilapidated roofs were replaced with new ones made from different coloured steel and new water tanks have been installed. The school principal, Tuhe Pio said: "The island's looking really beautiful. Now you stand back and instead of seeing rusty roofs you see a brand new village. People just look at their homes and feel very proud because they're nice." But the transformation may have come too late. Over recent years, the population of this remote island has almost halved... results from the 2011 census show that the number of residents is down from 141 in 2006 to just 77.